Marine 31 Polishing Pad Cleaner is a concentrated citrus-based degreaser that breaks up and releases stubborn compound and polish residue from buffing pads. Formulated as a low-foaming, easy-rinse detergent, Marine 31 Polishing Pad Cleaner is a must-have product for those that detail boats for a living or have a large collection of buffing pads. Marine 31 Polishing Pad Cleaner can safely be used to clean foam, wool and microfiber pads. Don’t wash your pads with dish soap! Dish soap doesn’t completely rinse out of your pads, therefore leaving a residue behind that will adulterate your compound or polish. Even worse, this residue will slowly eat away at the pad, compromising its integrity and increasing the chance that it will fail during a future polishing session. Marine 31 Polishing Pad Cleaner was specifically designed just for pad cleaning; it rinses freely and doesn’t leave any unwanted residue in the pad. Spent residue and oxidized gel coat is a buffing pad’s worst nightmare. If you neglect to clean your pads when you’re finished compounding or polishing for the day, the chemicals in the polish combined with the oxidized gel coat will slowly eat away at the pad, compromising its mechanical cutting ability. If you don’t properly clean your pads when you’re finished buffing, you might as well throw them out as they will be useless. Cleaning your pads with Marine 31 Polishing Pad Cleaner maximizes your investment! 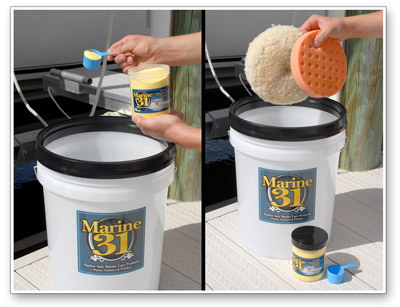 Marine 31 Polishing Pad Cleaner is as simple as adding a scoop of cleaner into a 5-gallon bucket of water and placing your pads in the bucket. After the pads have had about 15 minutes to soak, simply rinse them out under a warm stream of water and place them face down to dry. It’s that simple! Your pads will look, feel, and most importantly, perform like new for future polishing sessions. Marine 31 Polishing Pad Cleaner comes packaged in a 16 ounce jar. One 16 ounce jar is enough for 16 applications! We’ve even included a measuring cup so you know exactly how much to use. Marine 31 Polishing Pad Cleaner is harbor-safe and eco-friendly. Works as described! Not too sure if this is orange oxyclean with other ingredients, but it works great on getting the pads cleaned very well! I put a couple of old pads that havenâ€™t been cleaned in months just to see how it could tackle really caked in old wax, I used warm water in a bucket and put the pad in it with the solution, let them sit 20 mins , used a pad brush to loosen it up a bit, and took them out after 20 mins, gave them a good rinse, spinned them dry and let them fully dry face down over nite and they looked brand new! This stuff really works. I was reluctant at first, cuz of the price, but I've ordered a second jar.